Automatically add consistent branded signatures to all email sent through Exchange - Choose between the software's comprehensive template library or create your own bespoke Exchange signature designs. Use a dedicated central console - Control who gets what Exchange email signature wherever they are located and whatever device they are using. Ensure every employee uses the same Exchange signature and ensure no one uses their own - Email signatures are added at the server level via Exchange meaning no end user can modify their individual signature. Different signatures for different departments - Give sales an email signature highlighting a promotion. Give customer service an out-of-hours number. The options are limitless. 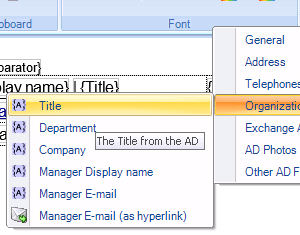 Auto-completed details from Active Directory - Pull data from each user’s AD profile so everyone gets the correct Exchange signature. 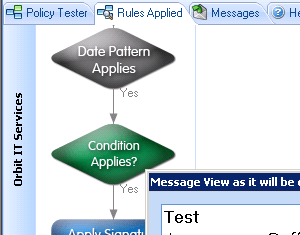 Use rules for controlling which signature gets added to which email - Rules can trigger a variety of scenarios such as which department a sender is based in, the content of the email body or the subject line. Added at the server level - As email pass through the Exchange server, they get ‘stamped’ with an email signature, dependent on rules you have defined. Simpler signature designs for internal emails - Include more useful information for employees such as internal extension numbers or a location within an office. Different designs for email replies - Stop email conversations getting flooded with signatures by creating a smaller design to include only the user’s name, job title and phone number. 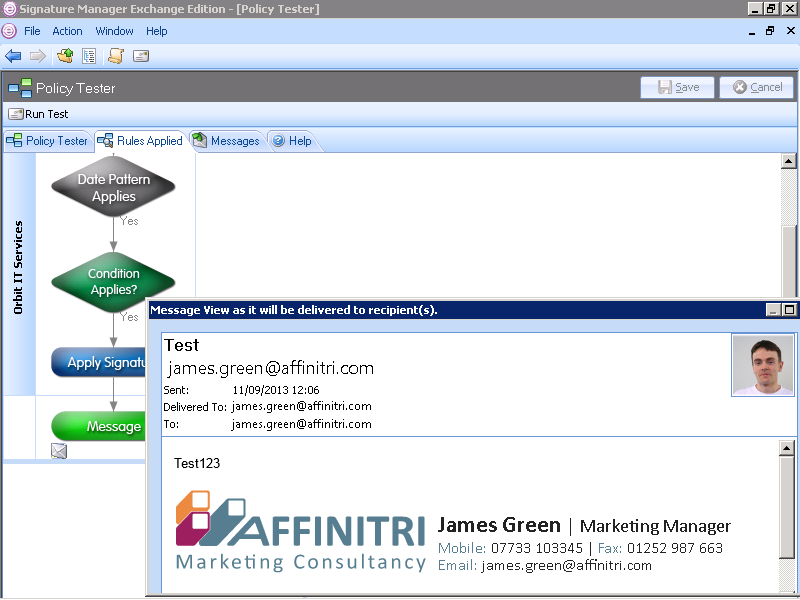 Test before you send - Make sure all of your Exchange signature policies work before you deploy them using our integrated Policy Tester. Work with powerful smart tables to easily add user information - Create an Exchange signature ready for a variety of contact details, while hiding fields not applicable to a user such as a mobile/cell number. Convert all email signatures into full HTML no matter what device an email is being sent from. The main issue with mobile email signatures is that some devices can’t send HTML signatures. This means a recipient will not see imagery like logos, photos and web banners. 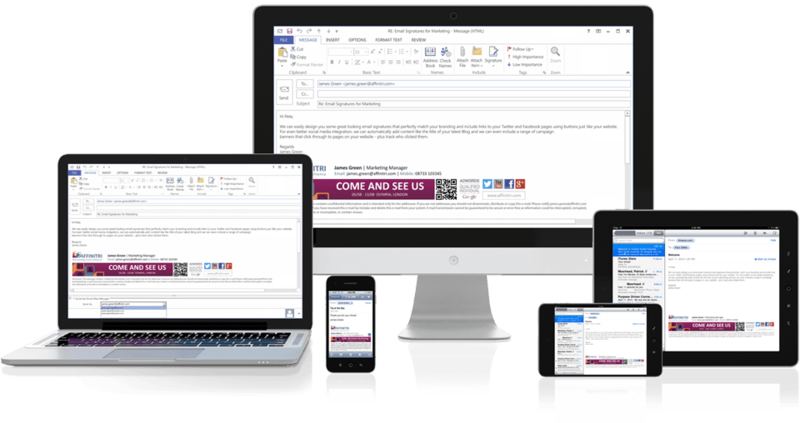 Whether your employees are using a smartphone or a tablet, Signature Manager Exchange Edition guarantees every email sent will have the same high-quality Exchange email signature you’ve designed. Promote important events, promotions and activities with your email signature - Use date-based rules to add and remove a promotional banner. You can even link your Exchange email signature up to Google Analytics and capture data on a banner’s effectiveness. Add social media links to your signature - Include a ‘Social Media Strip’ in your Exchange signature with all the official social network icons. Have dynamic content in a signature such as a recent Tweet or the headline of a blog post to get loads of new fans for free. Add QR (Quick Response) codes to all signatures - Use dynamic user data, decide on the colour and size, add custom URLs and embed images like your company logo – perfect for mobile centric users. Let marketing control signature template designs - Are you looking to give marketing direct control over signature creation and design? With Template Editor, your marketing department can create, edit and manage email signature designs without having to access the Exchange server, giving them direct control. 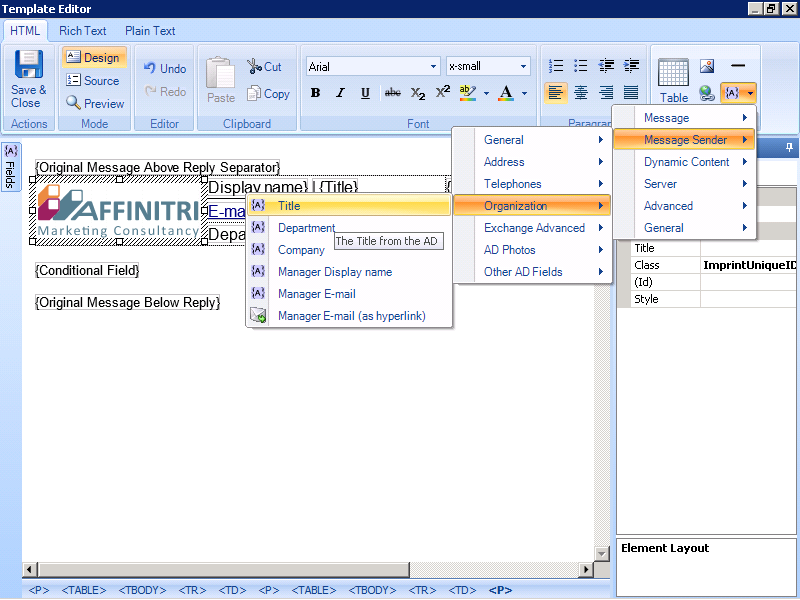 Learn more about Template Editor. Cover confidentiality breaches, adhere to various email regulations and prevent being liable for negligent advice by having a legally compliant email disclaimer on all signatures. 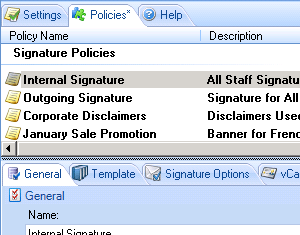 Add a fully dynamic email disclaimer to all users’ Exchange signatures to protect your organization's integrity. 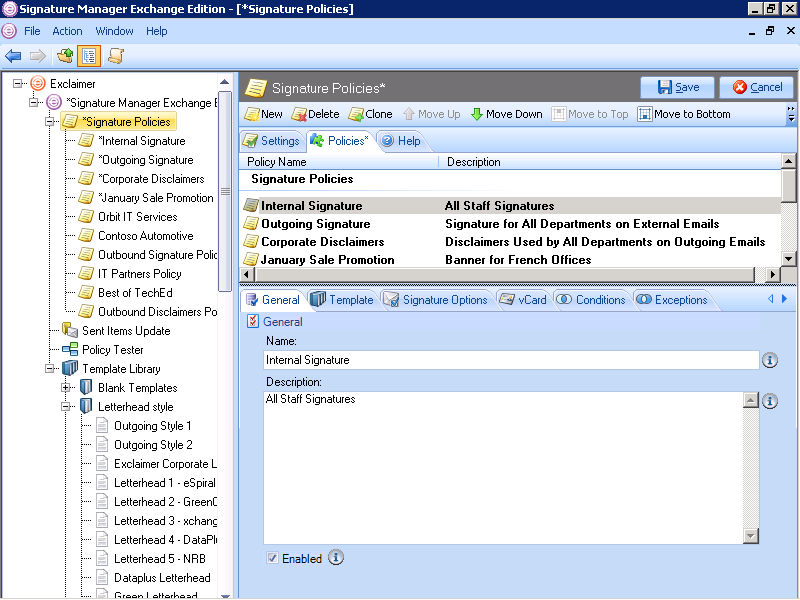 Get started quickly - Download Signature Manager Exchange Edition and our first Policy Wizard will have you up and running within minutes. Free trial with comprehensive support - Try the full version of Signature Manager Exchange Edition for free with dedicated technical support from our team of Microsoft Certified Professionals (MCPs). Exclaimer Signature Manager Exchange Edition version 2.2.7 has just been released to the Exclaimer website.